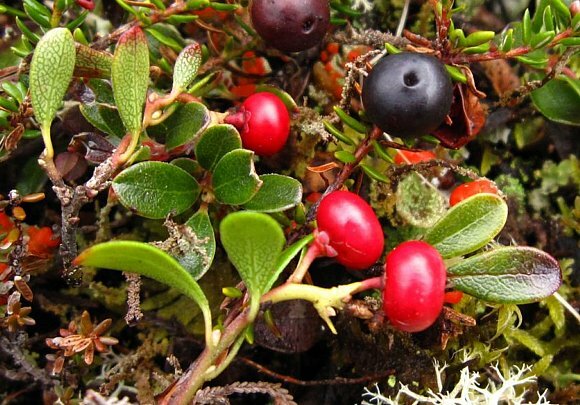 Unlike Arctic Bearberry which has round black berries, Bearberry has oblate spheroidal red berries (a bit like conquers). (The black or maroon berries at the top are Crowberry). The obverse of the leaves are lighter green and script-marked. The uppermost surface has a satin sheen. The lower stems woody. Over-wintered berries are bletted, and are now seen to consist of four or five fused segments each containing a seed. Easily confused with : Cowberry but is a sprawling prostrate undershrub which is never erect unlike Cowberry. The stems can trail up to 5 feet. Hybridizes with : Cowberry, the hybrid being called Hybrid Billbery or (Vaccinium × intermedium). The hybrid has darker leaves and is evergreen, whereas Bilberry is deciduous and Cowberry evergreen. It is very rare and seems to now only grow in the Grindleford, Derbyshire area. Some similarities to: Dwarf Willow in that both are low-growing plants on mountains but the leaves of Dwarf Willow are cupped inwards whereas those of Bearberry are curved outwards. 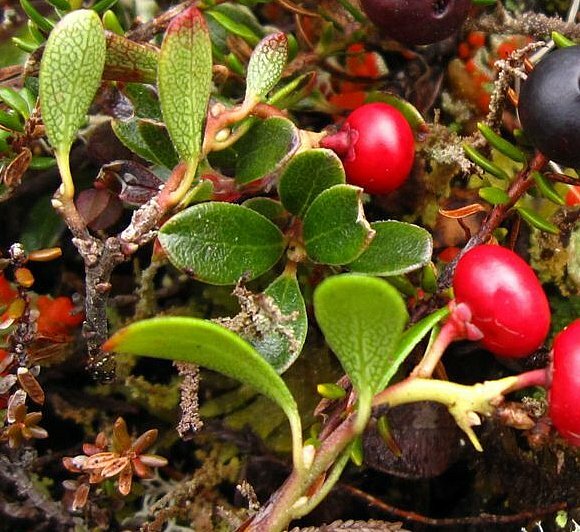 Related to : Arctic Bearberry but unlike Arctic Bearberry, where the leaves are deciduous, in Bearberry the leaves are evergreen, are paler beneath and not as deeply vein-grooved. Also, the leaves of Bearberry can be slightly round-toothed. No relation to : Bear's-Breech(es) nor to Barberry [plants with similar names]. Bearberry was previously placed into the Genus Arbusus but has now been re-assigned to the Genus Arctostaphylos. 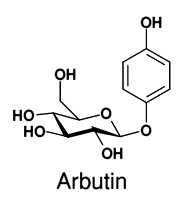 Arbutin, found in Bearberry and other members of the same genus, (and also in the Strawberry Tree - a member of the Arbusus genus) is a glycosylated hydroquinone. Arbutin prevents the formation of melanin in the skin which is generated in the skin in response to sunlight (a tan). Arbutin readily breaks down into a monosaccharide sugar and hydroquinone which is a compound used as a skin whitening agent. Arbutin is therefore also used as a skin-lightening substance. Perhaps a famous deceased pop-star used it? Arbutin has a high concentration in the skins of pears. Methyl Arbutin , where the topmost -OH shown is replaced by -O-CH3, is also present in Bearberry. 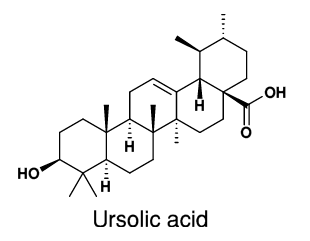 Ursolic Acid (aka Micromerol, Urson, Prunol and Malol) is found in a variety of plants belonging to the Heath and Mint families. It is present in the fruits of Bilberry, Cranberry and Bearberry, and also in other species such as Rosemary, Oregano, Thyme , Peppermint , and in Apple peel. It is a penta-cyclic triterpene acid, used in cosmetics for its anti-inflammatory, anti-bacterial, anti-fungal and anti-tumour activity. It is used in ointments for the treatment of burns and has anti-cancer properties when ingested. Like Bilberry it contains Hyperoside, a flavone glycoside and Arbutin , a hydroquinone glycoside. It is thought that Arbutin is hydrolysed within the alkaline parts of the human anatomy (urine in the bladder) to hydroquinone , and that it is the hydroquinone itself which is responsible for the anti-bacterial, anti-fungal, anti-septic effects on the urinary tract. Like Woodruff it contains the Iridoid Glycosides Monotropeine .